Junta Islámica signed, on Friday, November 23rd, 2018, a Cooperation Agreement with the Standards and Metrology Institute for Islamic countries (SMIIC). The signing of this agreement has been made by Ms. Isabel Romero (President of Junta Islámica) and Mr. Ihsan Övut (General Secretary of SMIIC) at the Medaweek International Conference where they met in the framework of the MedaHalal 2018 forum. This agreement implies that Junta Islámica will participate and contribute from its trajectory and experience to the development of halal standards for the OIC countries. In addition, both organizations seek to organize joint training and research activities related to the Islamic Economy. SMIIC is an organization promoted by the Organization for Islamic Cooperation (OIC). Created in 2010, it is the entity in charge of developing and promoting Standards and Metrology. With sixteen technical committees, four of them are focused in halal. They have also published four halal standards and is a reference entity in the Islamic world. In fact, the signing of this agreement comes to highlight the great effort that Junta Islámica has made towards the normalization of Islam in Spain. Junta Islámica registered its guarantee mark in 2003 and, since then, it has been working through its Halal Institute department to promote, defend and standardize the halal concept in Spain. SMIIC has highlighted, before signing, that ‘Junta Islámica did a great job creating Halal Institute to promote the Halal concept, protect the rights of Muslim consumers in Spain and that all these actions are consistent with the requirements that the OIC has around Halal’. Junta Islámica becomes one of the two Islamic Religious Communities in the world that have an agreement of these characteristics with SMIIC. 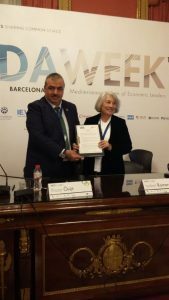 For its part, the President of Junta Islámica, Isabel Romero, after thanking SMIIC for their trust and recognition, declared that the agreement is ‘a great opportunity to advance, research and normalize not only aspects related to Halal, but all values that it promotes’.